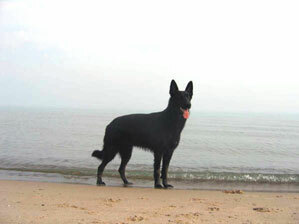 A solid black GSD is a very acceptable color in the German Shepherd Dog breed, but not seen as often as their sable or saddle back counterparts. 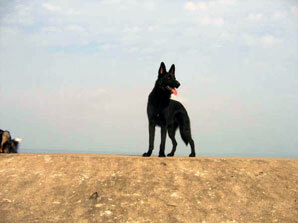 Visually very striking, black German Shepherd dogs are seldom solid. 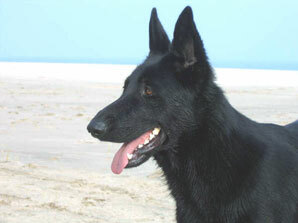 Most black German Shepherds dogs have a few tan hairs between their toes or around the rectal area, underneath the tail. The basic body color is controlled by the genes. 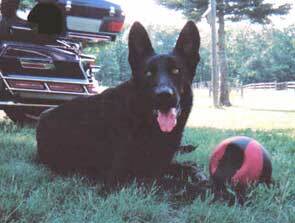 In Germany a Solid Black German Shepherd is referred to as "Lacquer Blacks". Primarily I think this is reference to the way in which the light reflects off their beautiful black coats - especially when they are well groomed and have that healthy shiny black coat gleam - just like in the finest hair shampoo commercial you've ever seen. 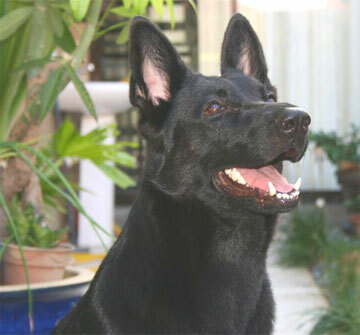 Black, just like in a solid white GSD, is a recessive gene that can be hidden for several generations before making an appearance. 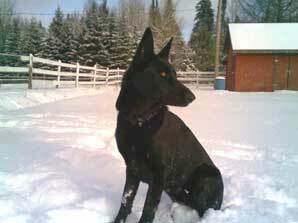 Solid black is recessive to both agouti and two-tone patterned dogs. 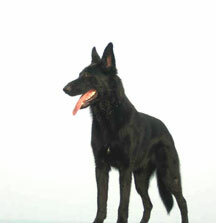 Both parents must carry the gene to produce solid black puppies. Please keep in mind that the color of the German Shepherd is in itself not important and has no effect on the character of the dog or on its fitness for work. 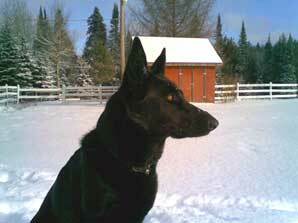 For that reason coat color is trivial and it should be a secondary consideration when choosing a new German Shepherd companion. 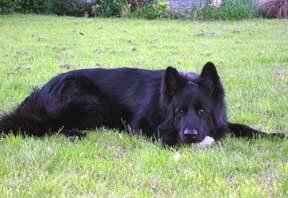 I have owned a black German Shepherd in the past - a beautiful black female German Shepherd and I can tell you they are simply stunning when well groomed. 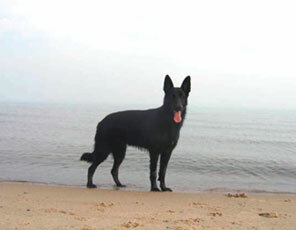 Do you own a black GSD? 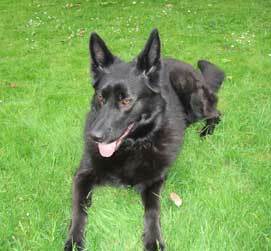 We would love you to share the story of your wonderful black German Shepherd Dog with us. And it's very east to do. 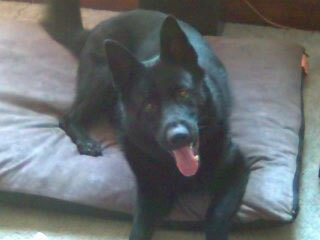 All you have to do is to to fill out the short form below - tell us your dogs story, add some pictures and you're done. 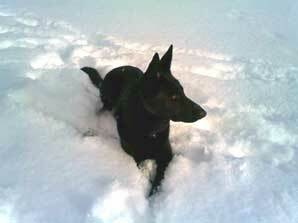 Plus, not only can everyone else read your black German Shepherds story, but you can read theirs too! 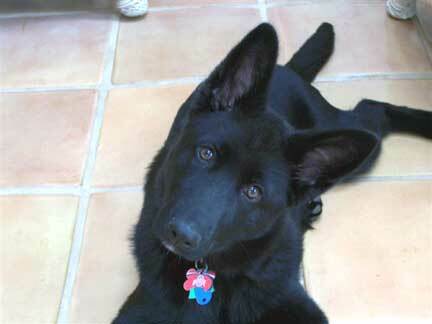 Tell us all about your Black GSD! 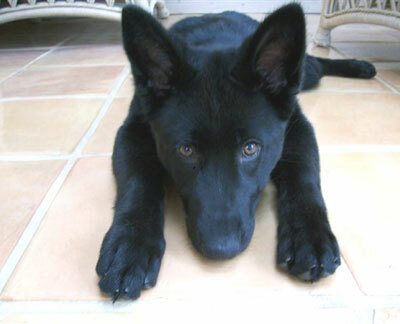 Our Black German Shepherd is a Work in Progress! 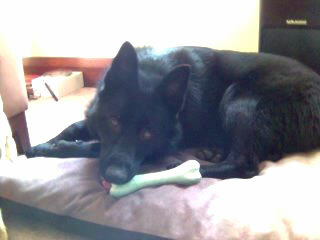 Black Jack is 3 yrs 8 months old. He has a Canine Good Citizen Certificate from the AKC. He loves soccer and tennis balls. 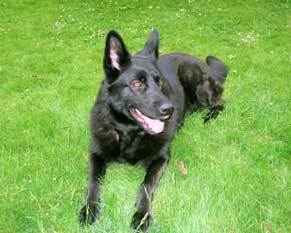 Below find a few pictures representative of the traditional solid black German Shepherd Dog. 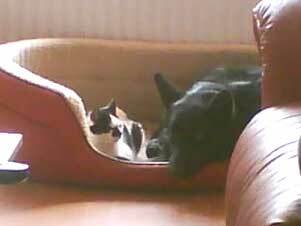 Thanks to all our readers who have shared photos and stories of their dogs with us all! We do appreciate it and please keep them coming our way!